National SQA Exams now in full swing for our S4 to S6. 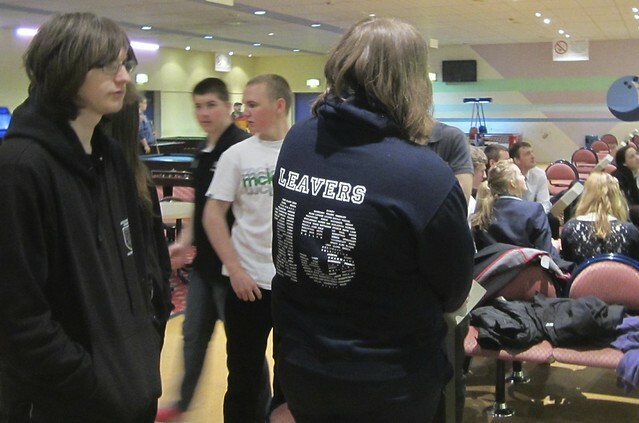 Pupils in S6, who will leave after their exams, held a farewell dinner in The Shieling followed by a trip to Inverness Rollerbowl on Friday 3rd May. We have been using this successful format now for over 5 years. This is intended to encourage all our pupils to feel they are leaving school as respected and successful young adults (rather than under a cloud created by a few immature acts quaintly referred to as ‘muck-up’ perpetrated by one or two boys in the past!) As in society, generally young people are often damned for the actions of a few but we should all be very proud of our youngsters in Gairloch. We wish the S6 well as they move into jobs, careers and future study. Many are going off to colleges and universities across Scotland to study a wide range of subjects this coming year including child-care, law, neuroscience and aeronautical engineering. On Wednesday 8th May former pupil, Helen Munday visited to talk to pupils interested in becoming a vet. Helen now works in Kirriemuir as part of a large practice serving the Angus Glens and surrounding farming area. We really appreciate that she found the time to come back and help support our pupils in their ambitions. Helen met with some interested pupils and explained what her job involved and how she achieved her current professional position. Last month we reported on a similar visit by former pupil and now product designer, Seonaid Nimmo. Curriculum for Excellence – Pupils involved in this new national initiative are now completing their third year. Older pupils in S4, S5 & S6 are currently sitting Standard Grade, Intermediate, Higher and Advanced Higher exams. For S3 pupils next year the exams will have different names and formats. We are moving to National 4 and National 5 exams followed by Higher and Advanced Higher exams. For the next couple of years these exams will have to run in tandem as the ‘old’ exams work out of the system. Staff in school are under a lot of pressure just now to develop suitable courses prior to the new exam structure while continuing to deliver the current courses. National 4 exams will be internally assessed and this also brings on a great deal of additional work including verification of standards. At the moment staff are currently trying to get to grips with the new assessment and examination models being introduced. For those pupils in S1 to S3 several changes have already taken place in the curriculum to assist delivery of Curriculum for Excellence (CfE). This week S3 pupils have been taking part in a series of Masterclass events. On Monday and Tuesday all were involved in a version of “The Apprentice”. From Wednesday to Friday pupils took part in other whole-day events including Emergency First Aid training, Art, cookery, ICT and Technology. These activities provided by both staff and visitors meet the expectations of CfE as part of what is now referred to as the “broad general education” of the pupils. 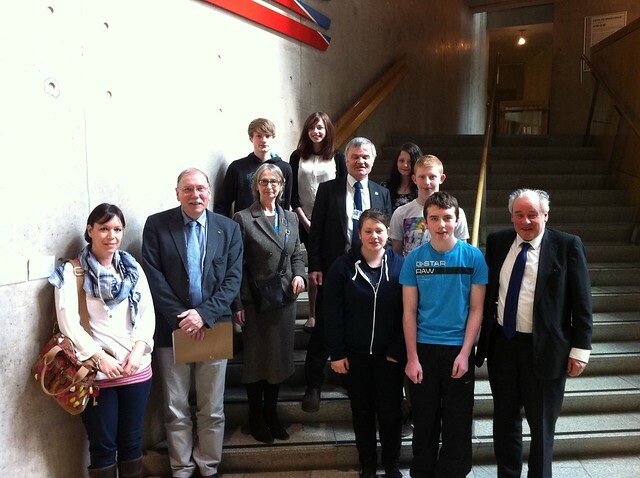 Although now part of CfE, pupils attending Gairloch High School have been receiving such experiences for many years. S1 at Nethybridge – S1 pupils have been at Nethybridge this week as part of their teambuilding activity week. We should be able to report more fully in the next issue however during the week pupils will have had the opportunity to develop skills learned in school out into the Cairngorms. Supervised by staff pupils will take part in hillwalking, mountain biking, orienteering and rock climbing. In the evenings they take part in games, quizzes and beach barbecues as well as spending the day at Landmark on Thursday. Have a look at some of the photos here both past and present. S3 Prefects – Several S3 pupils have been temporarily promoted to prefect status to shoulder the responsibilities of senior pupils while the seniors concentrate on their exams. These pupils are expected to operate to a higher standard of maturity in this role and learn to shoulder more responsibility. Russian Arctic Convoy Memorial Service and Arctic Medal Presentation Ceremony – Several pupils were involved as members of the ATC. 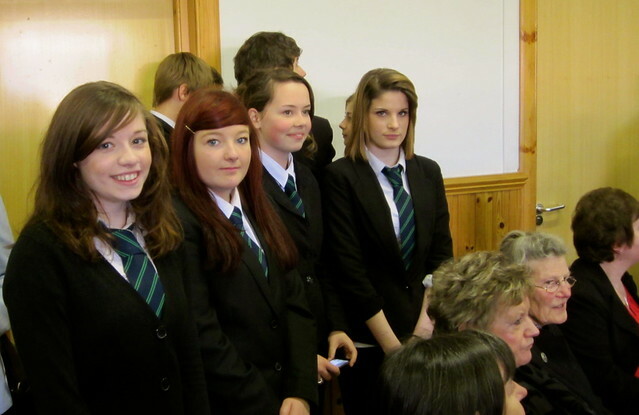 Seven of the newly appointed S3 prefects also attended representing all members of the Gairloch High School community. Our pupils reported that they found the events interesting and moving as they witnessed the emotions of the veterans and others. Click on the photo below to access many more photos of the day, including veterans receiving their Arctic Star medal. Earlier in the week Mr Jak Mallmann Showell visited our S2 in History class. S2 have just finished studying the Second World War with their teacher, Mrs Somers, and Mr Showell talked to them about German U-boats and the Battle of the Atlantic. Duke of Edinburgh’s Award – Ciaran Alexander has achieved his Bronze DofE and will be awarded at assembly after return from exam leave. Callum Vickerstaff has completed his Gold and will be invited to Holyrood Palace to receive his award in due course. Well done to both boys! Their names will be added to the school notice boards. Neil Gunn Writing Competition – Pupils were encouraged to enter this national competition by Ms Mackison as part of their study of English. We are very pleased to be informed by the competition organisers that Alfie Gudgeon, S3, has been awarded a commendation for his entry “The Only Thing”. The competition was open to pupils in the S3-S6 age group. Three prizes were available and only three further commendations have been made so we are particularly pleased that Alfie has achieved this although one of the youngest entrants. Alfie will be presented with his certificate of commendation at a ceremony in Dingwall in June. Introduction to Futsal Course – Futsal is an exciting, fast-paced small-sided football game that is widely played across the world and is officially recognised by both UEFA and FIFA. On Thursday 2nd May, Mr Gorman, Mrs Johnston, Luke, Ross B, Chris, Donnie and Kenny joined coaches from Wester Ross Youth FC and Leisure Centre staff for an introductory course on Futsal delivered by Peter Budge, SFA Development Officer. Peter showed us some drills to develop the skills needed to play the game and then the course participants tried out the game. All agreed it was more fun and more skills focussed than regular 5-a-side football and we look forward to integrating Futsal into our inter-house sports competitions next session. The boys who attended the course will lead training sessions to introduce other pupils to Futsal. Mrs Johnston will also be using Futsal in primary PE sessions to reinforce the work being done by Kenny Nelson at the Saturday morning football sessions. Thanks to Kenny for organising the course. 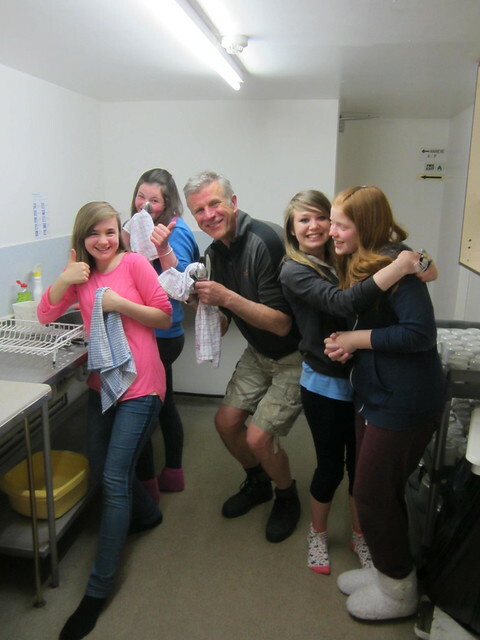 Food Hygiene to Gemma Urquhart; Emergency First Aid to Danielle Bulmer & Caitlin Johnston. West Highland College courses completed in school. Certificates presented by Susan MacLean to: Chloe Allengame, Leonie Baptist, Kiera Clark, Ashleigh Elder, Courtney Jackson, Ann MacLean, Nikki MacLennan, Caitlin Mitchell, Connor Moore, Sydney Tippett and staff members Carol Bulmer, Donna Hildrey and Graham Milner. Congratulations to everyone who received an award. Sabhal Mòr Ostaig – Air Dimàirt 16mh den Ghiblean, thàinig Lisa Moyes à Sabhal Mòr Ostaig airson bruidhinn ri sgoilearan mu dheidhinn na colaiste. Fhuair sinn tòrr fiosrachaidh mu dheidhinn na cholaiste agus na cursaichean aca agus bha cothrom againn ceist sam bith fhaighneachd. Tha mi an dòchas gum bi mi fhèin a’ dol ann am-bliadhna agus, mar sin, bho shealladh pearsanta, ‘s e cothrom math a bha ann. On Tuesday 16th of April, Lisa Moyes from Sabhal Mòr Ostaig came to speak to pupils about the college. 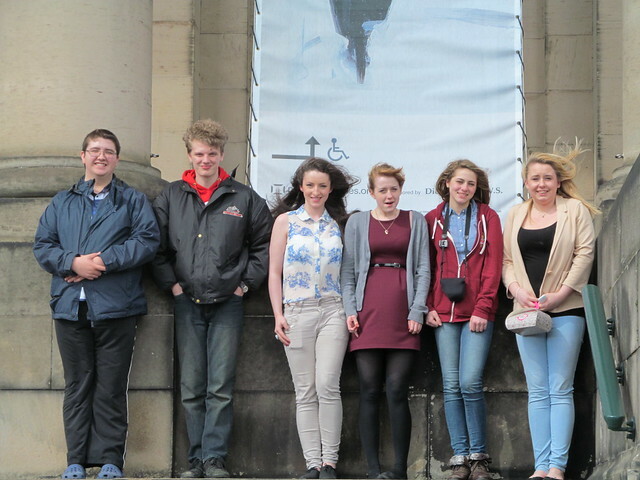 We received lots of information about both the college and the courses and had an opportunity to ask any questions. I am hoping to go to Sabhal Mòr Ostaig this year, so from a personal point of view, this was a good opportunity. Còig Latha / Five Days – le Max Conway, S1 – Ann ann Saor-làithean na Càisg, bha mi aig ‘Còig Latha’ agus, mur a h-eil fios agad dè tha ann, ‘s e cuairt còig latha a tha ann gu Carlabhagh ann an Leòdhas. Bha a’ chuairt seo uabhasach math airson a’ Ghàidhlig agam. Dimàirt, rinn sinn obair air a’ chroit agus ceòl. Chunnaic sinn ciamar a tha daoine a’ dèanamh a’ Chlò Hearrach agus a’ gearradh a’ mhòine, agus chluich sinn beagan ciùil Diciadain. Diardaoin, bha sinn a’ dèanamh ceòl airson a’ chèilidh an oidhche sin. Dihaoine, an latha mu dheireadh againn ann an Leòdhas, chaidh sinn a-mach gu Eilean Furach, eilean beag, agus rinn sinn beagan iasgaich. Bha a’ chuairt seo sgoinneil agus tha mi an dòchas gum bi barrachd dhaoine à Gearrloch a’ dol ann an ath bhliadhna. In the Easter Holidays I was at ‘Còig-Latha’ and, if you don’t know what it is, it is a five-day trip to Carloway in Lewis. The trip was very good for my Gaelic. On Tuesday, we did croft work and music. We saw how Harris Tweed is made, how peat is cut and played some music on the Wednesday. On Thursday we did music and that night we had a ceilidh. On Friday, the last day in Lewis, we went to a small island called Eilean Furach and did some fishing. The trip was amazing and I hope that more people from Gairloch will go next year. Wind Turbine – The wind turbine has undergone extensive repairs and appears to be fully functioning and much quieter! The turbine should now be available to generate electricity all the time and we look forward to reporting details in the future. 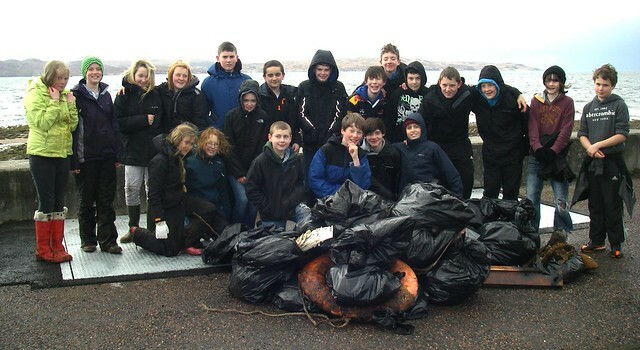 S1 Beach Clean – Our annual beach clean took place on Thursday 25th April. The pupils suffered inclement weather but worked over two hours to clear rubbish and debris from the beach front. Thanks to Miss Dean for organizing this and other staff for helping. Thanks also to the Council Services that once again supplied bags, protective gloves and later picked up the collected rubbish.